You are welcome to call me anytime at the number +386 (0)40 428 540 or +43 (0)680 5048 411 for Austria. Or contact me via e-mail, Facebook, Youtube or Skype (Ojster). I will be happy to give you an advice and recommend you the most suitable tools for your application. Shaping can be further divided into rough and detailed work. While surface finishing consists of sanding, application of oil, wax or paint and finally polishing. In my tobi.si online shop you will find tools for all the mentioned steps. I personally use them for wooden products, but some of the tools may also be used for a wide range of other materials. Some of them we are even using in our workshop where we produce injection plastic parts and silicone products. For areas where I have no experience I am open to personal presentation and on-site testing. This way we will be able to find the best solution for even the most specific of cases. It is actually so that many tools may be used in various situations, but are better suited for certain conditions and less for others. Orbicut milling tool for example is a great choice for freshly cut (still wet or moist) wood, but may also be used for dry wood or other porous materials. Advantages of rotary tools with blades are no dust - they cut away the wood and so byproduct are wood shavings and the resulting surface looks much like the one shaped with chisels. The following tools on my website fall into this category: Orbicut, Arbortech TurboPlane, MiniTurbo, TurboShaft. They are perfect for shaping freshly cut wood pieces. Lancelot disks with chain saw are also good for cutting fresh wood, but they are meant for rough shaping where you need to remove larger amounts of material. During cutting, sawdust flies from underneath the disc or discs and the resulting surface is rougher than with blade tools. Of course you can use all the aforementioned tools also with dry wood. Second group of rotary tools has no blades and it tears wood instead of cutting it. We are talking about Saburrtooth burrs available as discs for angle grinders or shaft rotary tools for a grinder or flexible shaft motors. I am covering a whole product range of an American company Saburrtooth. Advantage of Saburrtooth rasps is a wide collection of shapes, sizes and grits. Rough rotary burrs or discs may also be used for freshly cut wood, fine grit might however be problematic due to material sticking in between the spikes and clogging the tool. It depends on the wood type and it might also cause burning spots on the product. Thus I recommend to do the rough shaping with coarse grit rasps and then let the half finished product dry out before finalising it. This is not only good for the performance of burrs but also to prevent deformations when the product is already finished. Wood will namely often change shape during drying period and with a semi finished product you might still be able to correct them and create the shape you originally planned. The biggest advantage of rasps compared to rotary tools with blades is the effortless use of the tools. As much control as the rasps offer you, no other tools will. 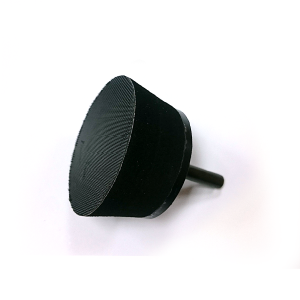 During working you have 100% control on the amount and speed of material removal, rotating tool does not cause any vibrations and it will not tear off any corners. You do not need much power to hold the angle grinder or grinder in your hands. For detailed work and with finer grits you can even use just one hand. The only safer tool is Orbicut with prescribed speeds up to 5.000rpm. With Orbicut you also do not need much craft controlling it. Tool does cause vibrations, but it will not create shocks which would want to pull it out of your hand. It will also not dig itself into a workpiece. You will have to guide it and press it into the material to actually remove something. It is however a slower process compared to rotary burr rotating with 24.000rpm and is therefore ideal for hobby and DIY enthusiasts. Or for those who want comparable surface to the one you get when working with chisels. Sanding is - at least in my experience - the lengthiest and most boring stage in creating a new masterpiece. And to me also the least favourite. Personally I enjoy it the most when applying oil which brings out the magical colours of the wood. But unfortunately, there is no skipping the strenuous sanding stage. You need to go through it step by step and in spite of all the various tools you will still need to use your hands in complex situations. A good advice would be, to consider the sanding phase already when shaping the piece. This way you might be able to avoid problematic areas by shaping them differently. Shape them according to the sanding tools you have, so you will be able to reach and sand all the surfaces and thus limiting your hand sanding. For those situations when you will need to use your fingers, I advise you to use Mirka Abranet sanding mesh and not the standard sandpaper. Why? As you will be sanding only fragments where you will have to fold, bend or roll the sandpaper to shape it against the objects surface. And as you well know, it does not handle folding, bending or squashing. It loses its effectiveness. Mirka Abranet on the other hand has no problems with deformations and it will also not clog (fill up). You have to try it if you haven’t yet. You can ask me for a free sample. Use of electrically powered sanding tools is something that can significantly shorten your sanding time. And I really mean significantly - up to ten times! It is a huge difference. Classic random sanders have no use with handmade objects as they are designed for flat surfaces, which we have none of or very few. For sanding freely shaped surfaces; let that be wood, stone, soapstone, bones, horns,... we need sanding mandrels, arbors or discs which will adapt to the surface we are sanding. This can be achieved by a foam, soft rubber or inflatable shape. All of these options are available in my tobi.si webstore. 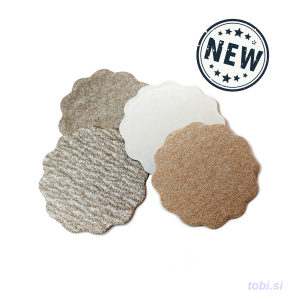 For convex shapes or sanding of toned surfaces (old type of backrests on wooden chairs for example or intricate railings), curved edges (on music instruments like guitar, violin,...) you can use inflatable Kirjes sanding cylinders which will adapt themselves to the surface you are sanding. 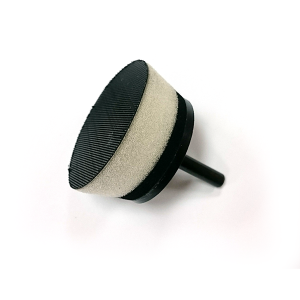 If you wish to remove small bumps from a curved surface, like larger bowls or curved plates, you can use foam sanding mandrels (arbors, discs) which you can propell with classic battery powered screw guns or electric drill or fixed into the Kirjes flexible shaft with the motor for sanding and polishing. These mandrels work really great on convex as well as on more open concave surfaces and I assure you it is the most cost effective way of sanding. You will be amazed at the speed of it and the end result as well. You may contact me for a free sample. 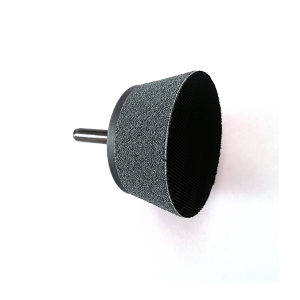 For more closed concave surfaces you may use softer foam mandrel (powering it with a right angle drill) or Kirjes inflatable half spheres, which are perfect for sanding more curved bowls, cups, deep vases. With them you may reach deep inside a bowl or vase and even sand negative edges. Arbortech Contour Sander differs itself from abovementioned tools as it does not turn but vibrates because of the excenter in the attachment shaft attached to the angle grinder axis. You may use it for sanding complete surfaces, but I recommend it more for details and carved sections where the use of larger sanding surface tools is not possible. With Contour Sander you will only use the soft rubber edge and thus also just the outer edge of the adhesive sandpaper discs. Rubber edge will really adjust to every shape of the edge - it also works when bent by 90°. During sanding with Contour Sander try not to lift the sanding disc off the surface as the disc starts spinning when not touching the surface and you may cut into the piece if not careful (especially with rough grit). 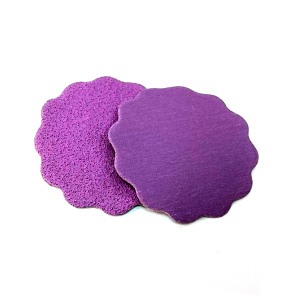 Unused middle part of the self adhesive sandpaper discs can be great for sanding by hand as it will stick to your finger and you can reach some hard to reach areas this way. So do not throw them away once the edge is used up. With above mentioned tools you will really be able to sand most of the surfaces, but there will be situations where you will still have to use your fingers. It is those moments when you will really come to appreciate the help of electricity. Independent from the sanding method you are using, you always have to proceed step by step to a finer grit. Do not skip the steps as you will leave out deeper individual cuts which will be left there to the end or will take longer to sand out with a finer grit. If you discover a deeper scratch, it is better to go back to the rougher sandpaper and clean it out. It’ll be faster this way. Before applying oil, it is good to moisten the surface as any left out scratches or imperfections will show up and were not visible on a dry surface. Once you apply oil, you will namely see all the “mistakes” and any scratches you might have left out. And believe me when I say that sanding an already oiled surface is no fun. I would like to hear from you about your experience with shaping and sanding. Perhaps some feedback about the tools I am offering and talking about, or if you have some more effective solutions. Perhaps you have some useful tips or tricks you might be willing to share? In any case I wish you a lot of joy, creative ideas and of course grateful clients!